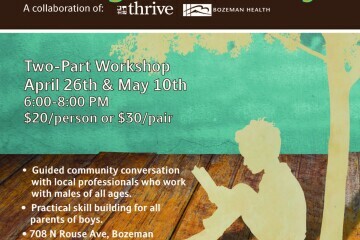 Join Thrive & Bozeman Health for this two-part workshop on Raising Resilient Boys. Dinner and free off-site childcare (limited spaces) will be provided. The workshop will be held on April 26th and May 10th from 6:00 – 8:00 pm at Cinnamon & Sage Catering & Events, 708 N Rouse Ave Bozeman. Cost is $20/person or $30/pair.